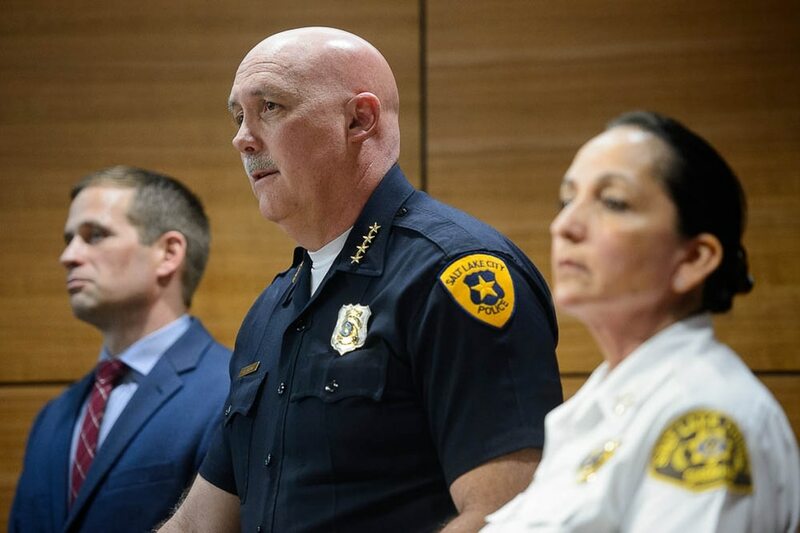 (Trent Nelson | The Salt Lake Tribune) Brian Redd, Utah Department of Public Safety, Salt Lake City Police Chief Mike Brown, and Salt Lake County Sheriff Rosie Rivera at a news conference in Salt Lake City on Tuesday April 9, 2019 addressing a crime spree and shootout the day before. (Trent Nelson | The Salt Lake Tribune) Brian Redd, Utah Department of Public Safety, Salt Lake City Police Chief Mike Brown, and Salt Lake County Sheriff Rosie Rivera at a news conference in Salt Lake City on Tuesday April 9, 2019 addressing a crime spree and shootout the day before. 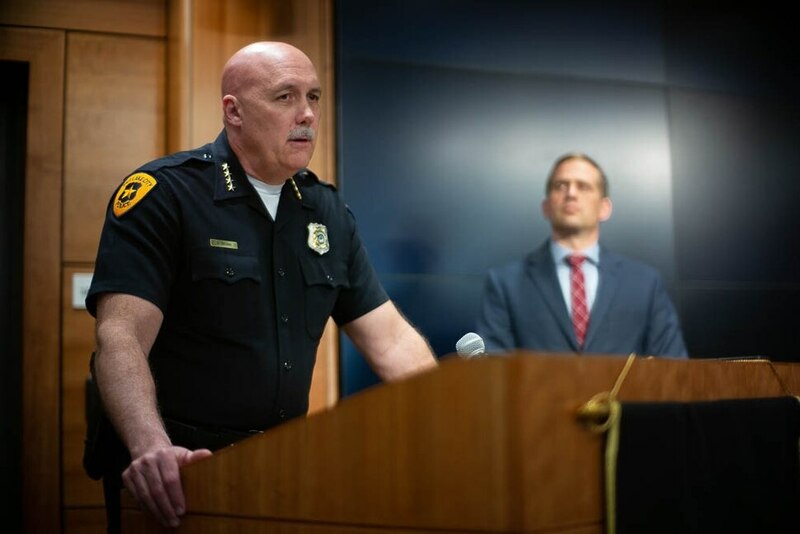 (Trent Nelson | The Salt Lake Tribune) Salt Lake City Police Chief Mike Brown, and Brian Redd, Utah Department of Public Safety, at a news conference in Salt Lake City on Tuesday April 9, 2019 addressing a crime spree and shootout the day before. 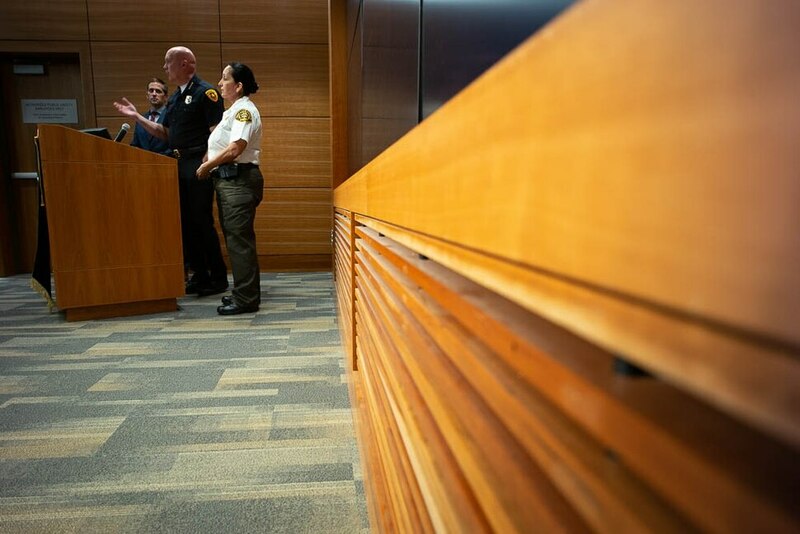 (Trent Nelson | The Salt Lake Tribune) Salt Lake County Sheriff Rosie Rivera, Salt Lake City Police Chief Mike Brown, and Brian Redd, Utah Department of Public Safety at a news conference in Salt Lake City on Tuesday April 9, 2019 addressing a crime spree and shootout the day before. Fifteen peace officers from three police forces were on leave Tuesday as investigators continued examining a crime spree and shootout in Salt Lake City a day earlier. The suspect, Harold Vincent Robinson, 37, of West Valley City, died in the shootout on State Street near 3300 South. The paid administrative leave is standard procedure after an officer participates or is believed to have participated in a shooting. Ten Salt Lake City police officers are on leave; three from the Utah Highway Patrol and two from the Unified Police Department. At a news conference Tuesday in Salt Lake City, the city’s police chief as well as the county sheriff placed the focus on the officers. Counseling has been offered to all the officers and troopers who responded Monday. Salt Lake City Police Chief Mike Brown called the way Robinson was said to have driven through the city, firing a rifle at police, “your worst nightmare." Brown said he couldn’t remember another time in his 28 years with the department that 10 officers were on leave. Brown said the department already has had to rearrange shifts and pay overtime to cover for the officers who aren’t allowed to work. The city has about 550 officers, including those recently absorbed by the consolidation with the police at Salt Lake City International Airport. “Yesterday, we dealt with one of the most dangerous situations a police department can ever deal with," Brown said. 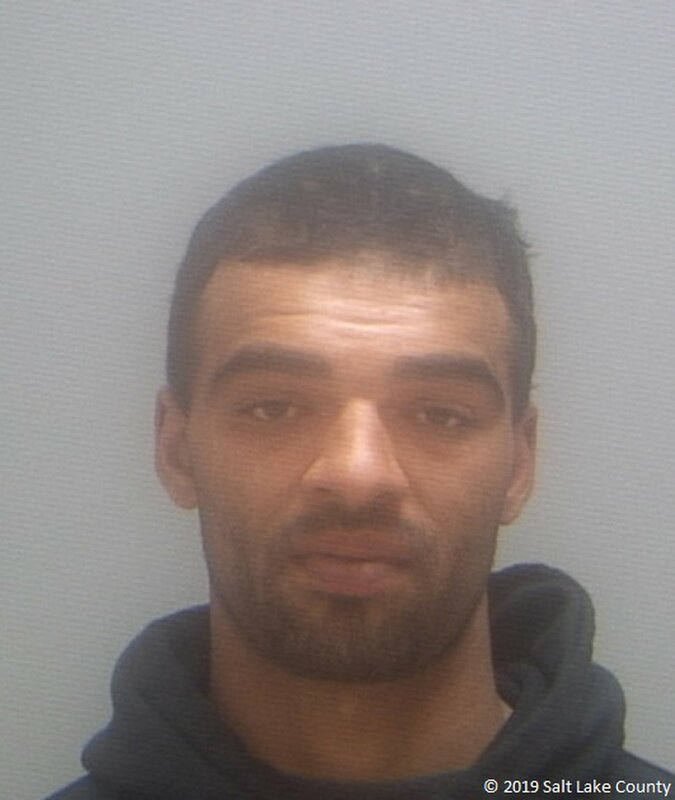 (Courtesy Salt Lake County jail) Harold V. Robinson, Jr.
Rivera said at Tuesday’s news conference that officials would not answer questions about the investigation, which is being conducted by a West Valley City police-led protocol unit. Bret Rawson, an attorney who works for the Utah chapter of the Fraternal Order of Police, said he was called yesterday to represent a “handful” of the officers involved in the chase and shooting. Rawson, who also is certified as a peace officer, said his clients are being given two or three nights of sleep before investigators interview them about what happened. That’s become a standard procedure when police are involved in traumatic events. Salt Lake City police identified Robinson as the suspect Monday afternoon. The Salt Lake County sheriff and Salt Lake City’s police chief said Monday that there was no indication anyone else participated in what they described as a crime spree that stretched across much the county. The episode ended with a trail of gunfire from the edge of downtown Salt Lake City to the crash at Princess Alterations, 4 miles south. In the aftermath, drivers found themselves snaking through south central Salt Lake City because of all of the road closures. Intersections down State Street from 500 South to 3500 South were blocked much of Monday, as were some intersections to the east — the direction in which witnesses said the suspect was firing out his driver’s side window — while police picked up bullets and shell casings and photographed crime scenes. The first robbery was reported at 10:06 a.m. at a Holiday Oil gas station near 2700 W. 4700 South in Taylorsville, said Rivera. About a half-hour later, at 10:37 a.m., gunfire was reported in a robbery at a 7-Eleven near 900 East and 3300 South in Millcreek, she said. Gunfire was reported again at 10:42 a.m. near West Temple and 500 South, where officers began to chase a white pickup that was fleeing from the scene, said Brown. Brown and Rivera said the driver, later identified as Robinson, was suspected in all three robberies. As for how he traveled 5 miles on busy city streets in five minutes, Rivera on Tuesday emphasized the times reflected what time police were called. Extra minutes could have passed before police were called to the last robbery, she said. A news release Tuesday morning said police attempted to place spike strips in front of Robinson to stop his truck. When that was unsuccessful, an officer drove his police car into the rear side of the truck in what’s called a pit maneuver. Robinson was federally indicted in 2001 for using a sawed-off shotgun. It is illegal to shorten the barrel of a gun, which Robinson told the court that his friend had done when it got plugged with dirt while hunting. The judge sentenced him to 42 months of probation. He violated those terms and was later sentenced to 18 months in prison. The court docket says Robinson used that sawed-off gun in threatening to kill someone, but he contended that did not happen. He filed a civil complaint, in which he represented himself, petitioning to get his gun back. The 10th Circuit Court of Appeals recently denied his motion. Robinson had a criminal record in state courts, too, though many of the charges — including counts of aggravated kidnapping and assault — have been dismissed. He pleaded guilty to misdemeanor assault in 2003 and failing to obey an officer in 2012.